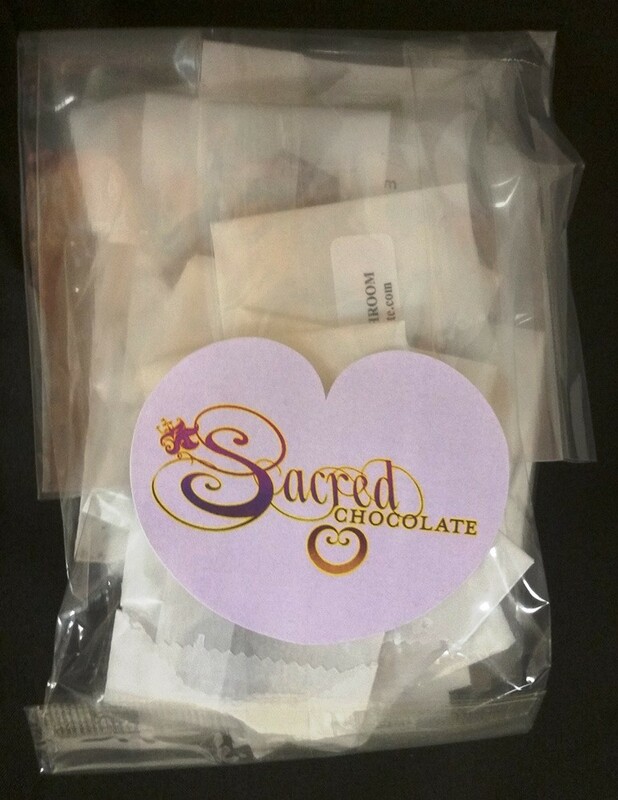 An eco-friendly bag containing a 1.7 gram bite-sized mini heart (or small piece) of each of Sacred Chocolate's flavors: Mylk, White Passion, Gotcha Matcha, 69% Twilight, 83% Midnight, India Sunset, Mint, 100% Heart of Cacao, Coco Nibby, Mocha, Holy Hemp, Zero Pointe Mint (Diabetic Friendly), Sun Sweet (Diabetic Friendly), Goji Nibby, Immuno Mushroom, Amazonian, Holy Cacao, Gold Ormus, Longevity Bliss, Noniland, TuMo and Reverse. For detailed information on any flavor, please click on the below links. 6 Heart Pack PLUS 1 FREE Longevity Bliss Heart Bar!